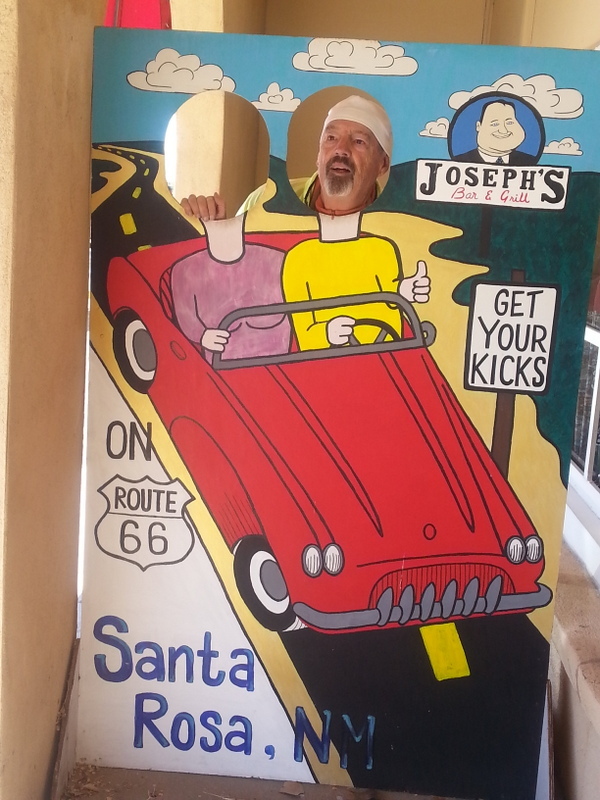 Being near to Route 66, we decided to bicycle into town to see what Americana really looks like. From our campsite at the Santa Rosa State Park, the trip was about 12 miles each way, give or take. Route 66 through town is five lanes wide, most of them empty. Very little traffic. 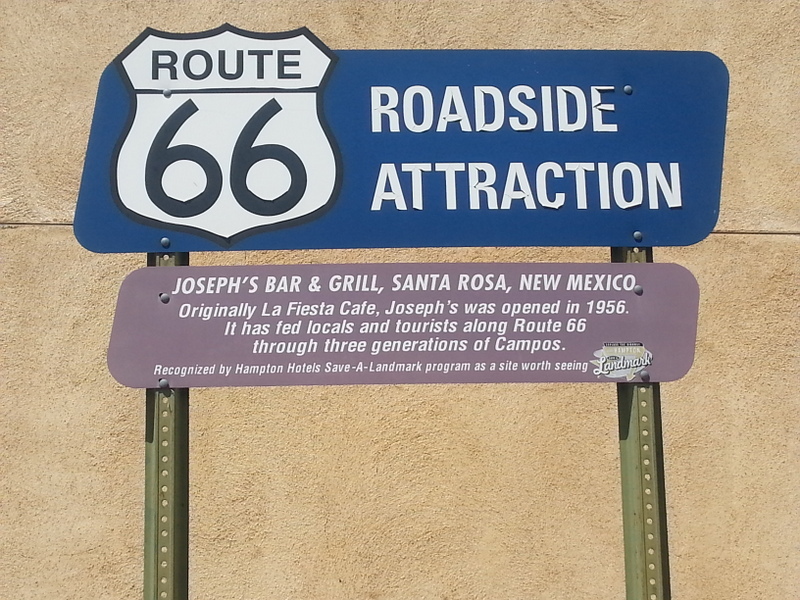 This is a town of less than 3000 people, with a few relic motels and restaurants along the Route 66 strip, and other more modern hotels as well, but not much else. The huge old neon signs, now dark, are a reminder of the glory days of this famous roadway. There just isn’t much left of that feeling. 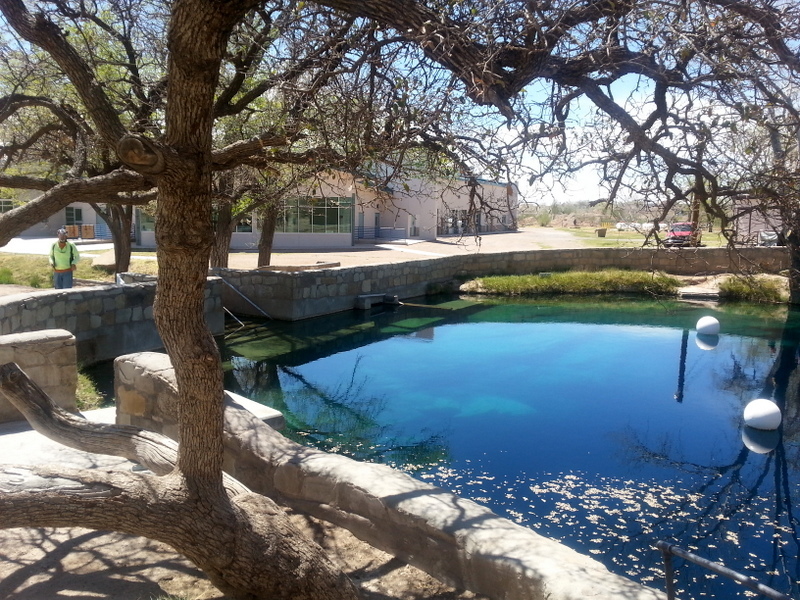 The big deal in Santa Rosa is the Blue Hole – a natural sinkhole, surrounded by rocks which has a constant 61 degree temperature year-round. It’s 80 feet deep. Like a tiny, really-clean community swimming hole. A few other tourists joined us at the site, but it was pretty cold (40s, in spite of the bright sunshine) and not all that conducive to taking a dip. Apparently, there are folks who come here to scuba. There’s a dive shop nearby, and warnings about getting the bends. The water really is a striking bright blue. We had a celebratory beer at Joesph’s, an iconic Route 66 destination, and stopped in at the hardware store (we’re hardware store people), then pedaled back to our campsite. Remind me to thank John for being always willing to step into a photo. I remember when Route 66 sounded so exciting. Most of it is now buried below I-40. 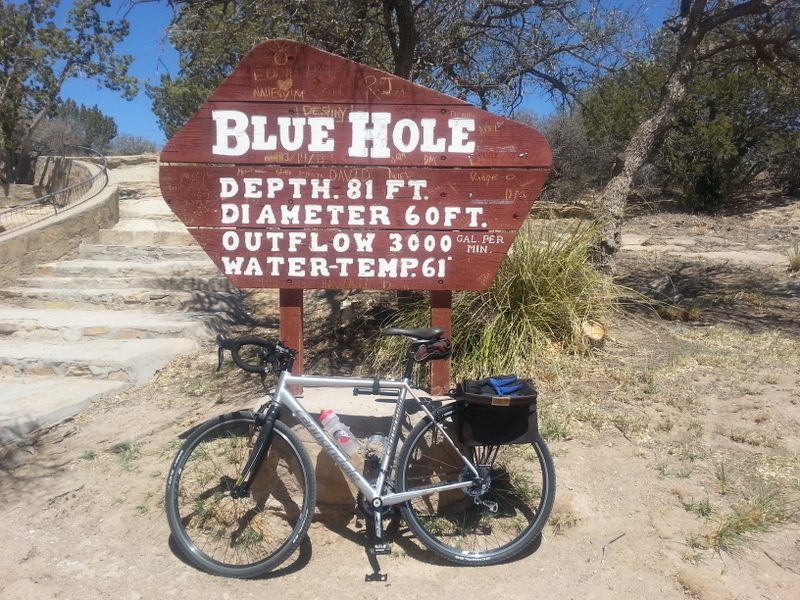 This entry was posted in great outdoors, New Mexico, retirement, Route 66, RV life, simple camping, T@DA, weather and tagged cycling, New Mexico, retirement, road trip, Route 66, RV life, simple camping, T@DA by Judy Crankshaw. Bookmark the permalink. When I was in high school (’63)�we drove back from San Francisco on parts of Route 66.� It was truly the iconic Route that we heard so much about at that time.� But it was very busy with truck traffic and lots of VW’s.� Glad to hear the weather is�better.� We’ve been swamped.� And now it’s going to get cold again.� Weird!� Safe travels.